Those of you that know me know I like to eat good food, with good friends in unique places. After gobbling down cold meals and fast food for the last 30+ years in the Fire Department, I really don’t care for most of the roadside, stamped out, sameness of the franchised eateries in the good ole USA. Let’s face it, the McDonalds in Hawaii looks (and tastes) just like the one in Baltimore or anywhere else for that matter. I make one exception, Cracker Barrel. 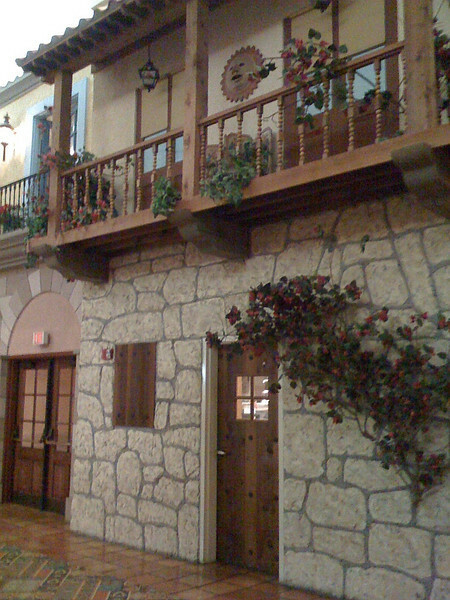 They get it…good food…friendly service…terrific atmosphere and good price. What I really like and hunt for are the home town, family restaurants and diners. The kinds with the quirky signs, big chickens, windmills, giant hot dogs etc. A throw back to simpler times. These are places where all the locals gather and discuss the latest gossip over great coffee and a few extra calories and cholesterol. Donna and I have found many of these places during our travels and we will publish our favorites from time to time. In the meantime…some of my ramblings will have to do. These kinds of places can be easy or hard to find. It just depends on the location. 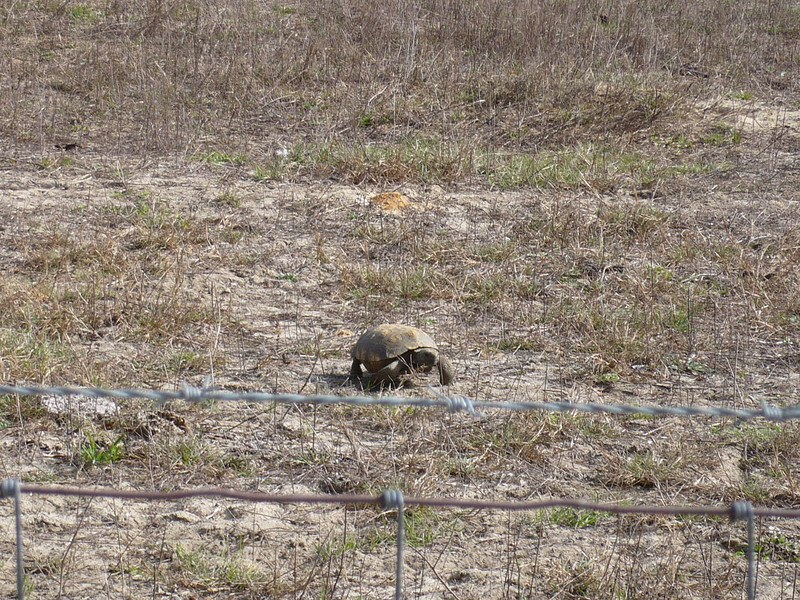 Some are stand-alone, others are in strip shopping centers, buried behind who knows what. If all else fails or time is of the essence…ask the locals. 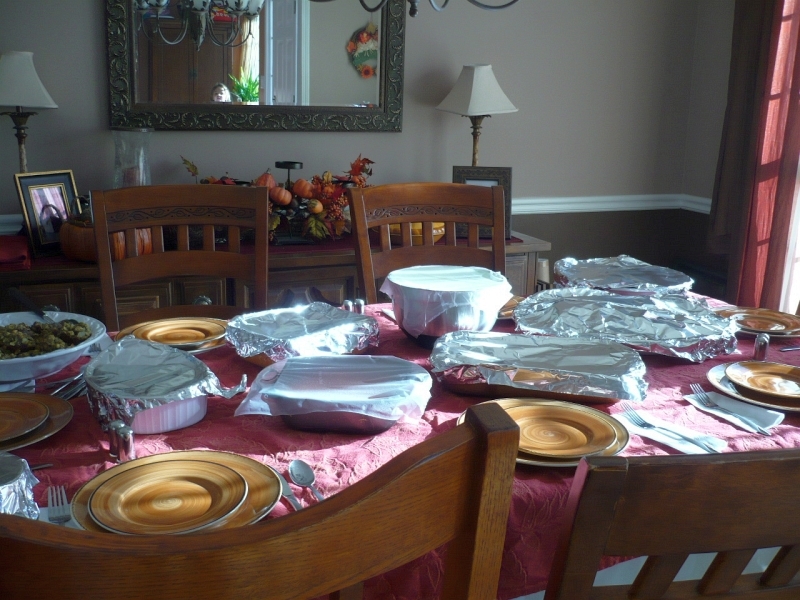 “Til next time…Keep rollin’ (and eating)..we will"
Last day of the year....wrapping up! Well, it looks like we will finally be leaving Florida and heading to Texas. Of course since our plans are set in Jell-O, we'll be taking a little side detour to North Carolina first. Why? 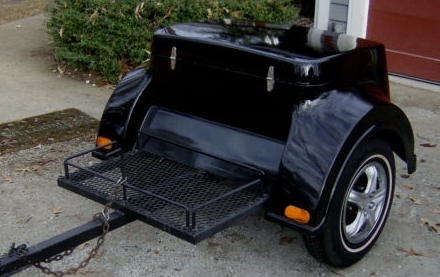 Well, we've been debating getting a trailer to pull behind the motorcycle thus allowing us to do some overnight camping - longer trips - more sightseeing. At first we thought we would get a little pop-up tent trailer, keeping these old bones off the ground. The more we thought about it, the less cost effective it seemed. It would take quite a few hotel nights to cover the initial cost. We finally decided it wasn't the best decision for us and switched our search over to a little cargo trailer. We could then either stay in a hotel or get a tent/sleeping bags and do the camping trick. We'd looked at several in person and a lot more on-line. One of our criteria was the ability to stand it on end in the garage, the only way for us to store it. Many just wouldn't work that way, others were too long (thus tall in the garage), some were too heavy, some too expensive. Well, guess what...we found one that was just right and better yet, it was used (eBay) so the price was just right. Stu had never bought something on eBay so I coached him a little in setting his bids - not too high and not too early. He got to enjoy watching the last two minutes to see if his high bid was out bid. Down to the wire we watched....and we won! The trailer is in New Bern, NC so from here we'll head north to pick it up and then on to Texas. Here are some random photos from our rides....just couldn't resist them. 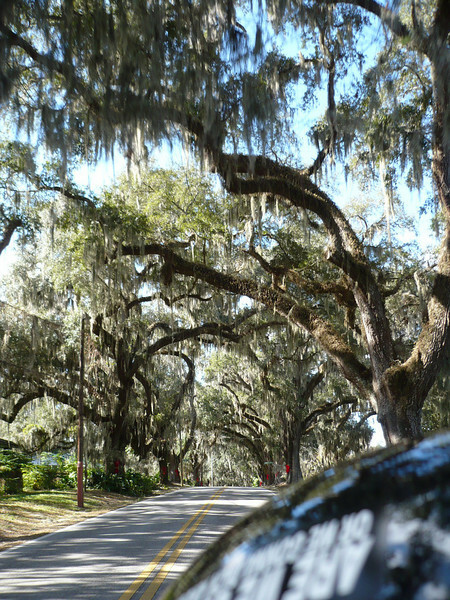 This area of central Florida is filled with huge oak trees covered with Spanish Moss. 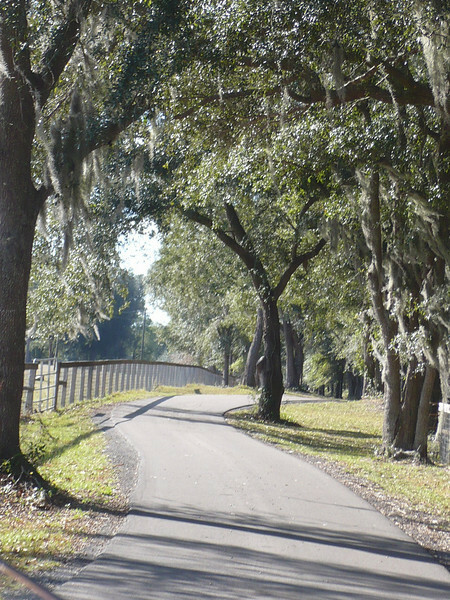 I love the arch effect they create on some of the back roads. I tend to forget to snap shots but this time I remembered. 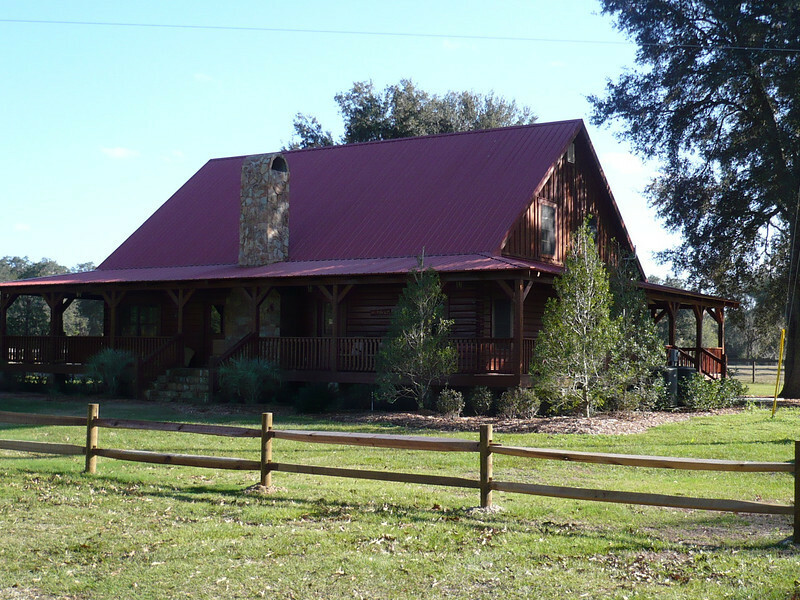 And here are a couple of log homes we took photos of...just cause we like them. LOL! 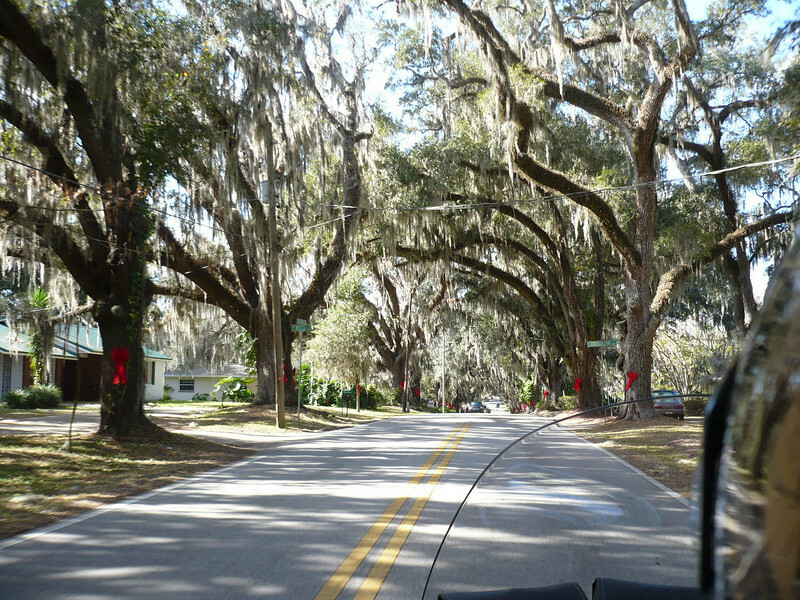 Also, a winding tree-lined drive we enjoyed. We'll enjoy a quiet evening of wine & movies....toasting the passing of 2008 and the coming of 2009. We send our wishes for a better year ahead to all our family and friends. It's been a tough 2008 for many, including Stu. Well, the post wasn't up but a few minutes and the requests came in for the recipe. 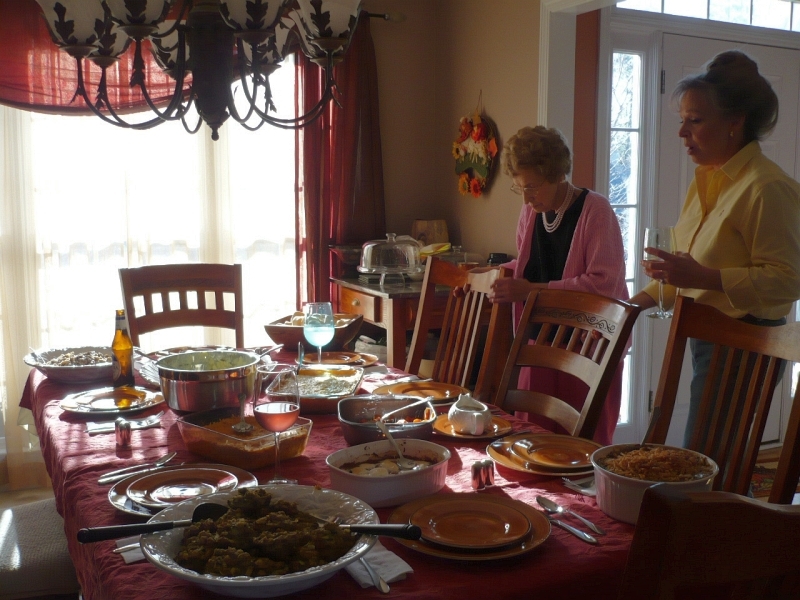 I got the recipe from a dear friend, Peggy (in MD) about 10 years ago and it's been my favorite for potlucks. Easy, good for you and always a hit. You can make low fat and sugar free by replacing a few items. Enjoy! 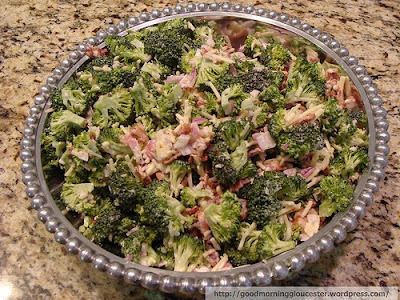 In a medium bowl, mix broccoli, cheese, onion and crumbled bacon. set aside. Mix mayonnaise, vinegar and sugar until dissolved. pour over and mix with other ingredients. Cover and store in refrigerator until ready to serve. Overnight is best but not necessary. 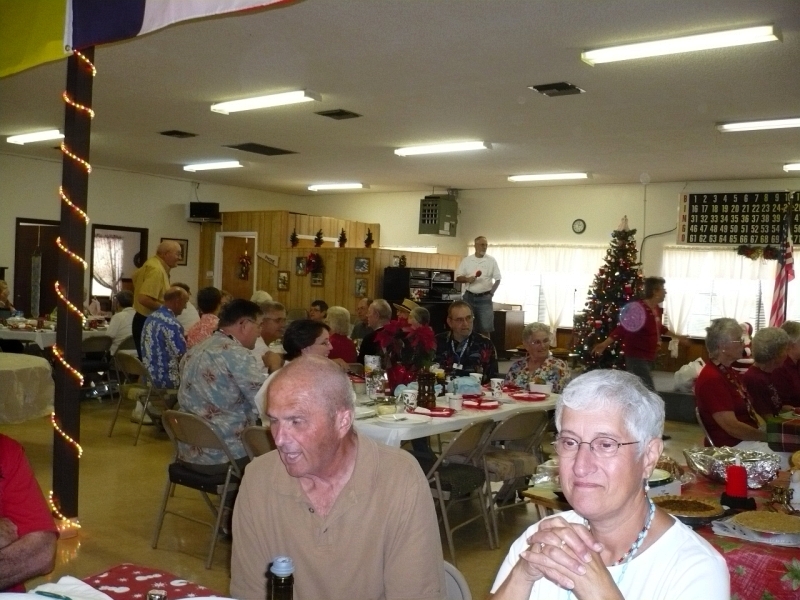 When I went to take the Christmas potluck dinner photos off the camera, I found some older ones that I had forgotten about. So today will be a montage of photos and topics....LOL! 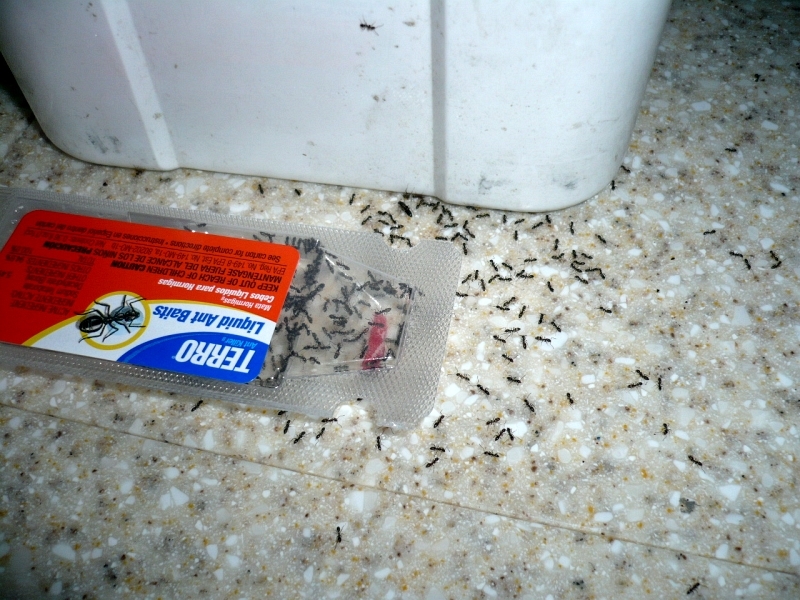 If you've followed our blog for a bit, you remember when we came back from Cancun and found ants swarming. We picked up some bug spray and boric acid powder and managed to get rid of them...but then again, this is Florida. Shortly after arriving here in Bushnell we had another swarm. Off to get the heavy duty stuff...Terro. That solved it for a while...then another swarm. More Terro and we treated all outside entrances with bug spray and boric acid powder followed by pet flea collars around all the axles. I did snap one shot so scroll quickly if ant photos make you itch. LOL! 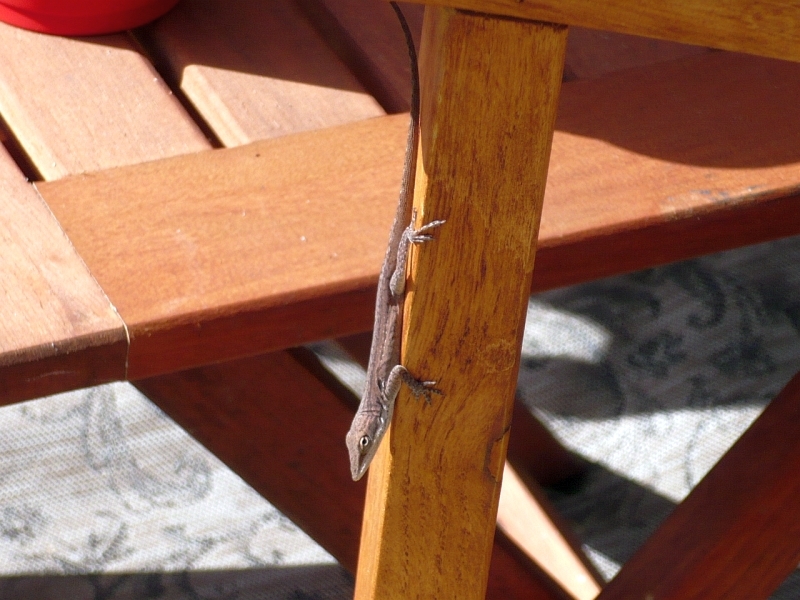 Another day I when I went to sit outside to read for a while, I had to share the chair with this little critter. 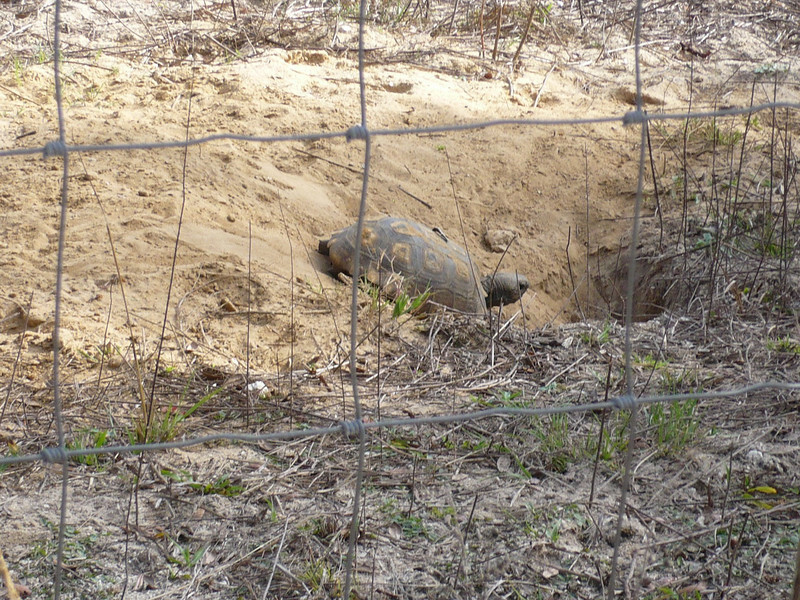 He decided to vacate rather than share. On an evening walk one night, we met a lady out walking her Dalmatian one evening and chatted for a bit. They had just arrived and had their motorcycle with them. Well, when we walked over to the community center for Christmas potluck dinner, their bike was parked out side. 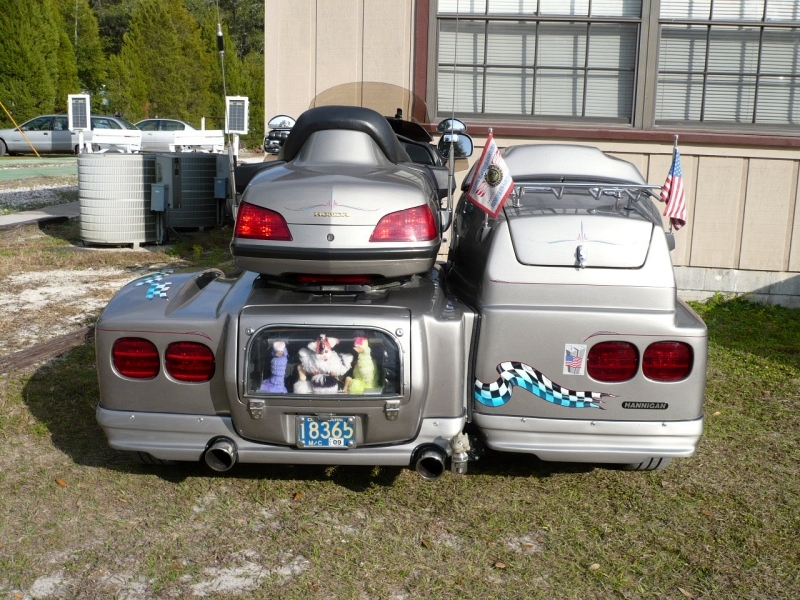 A truly unique vehicle, what starts out looking like a trike ends up as a combo trike/sidecar. 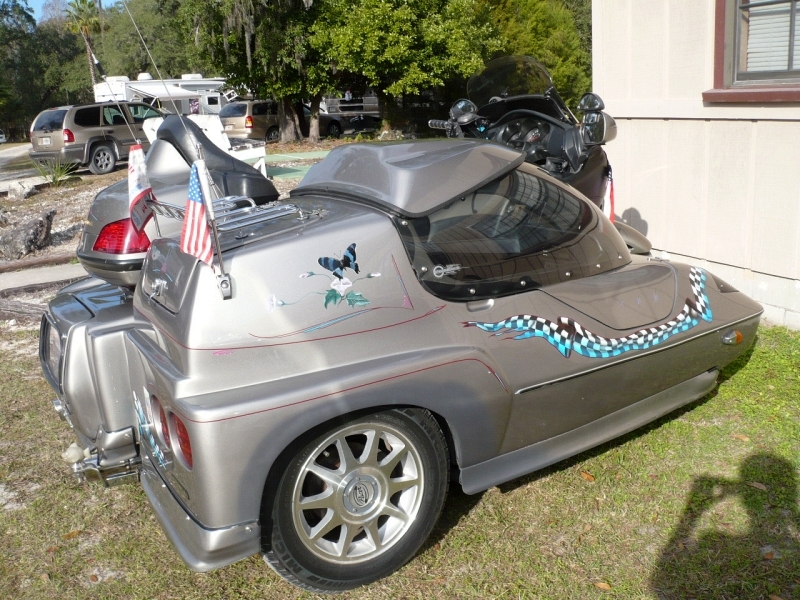 The rear view is particularly unique, the trunk has a glass door and inside are a couple of marionettes that MOVE when the bike is moving. It's hysterical! 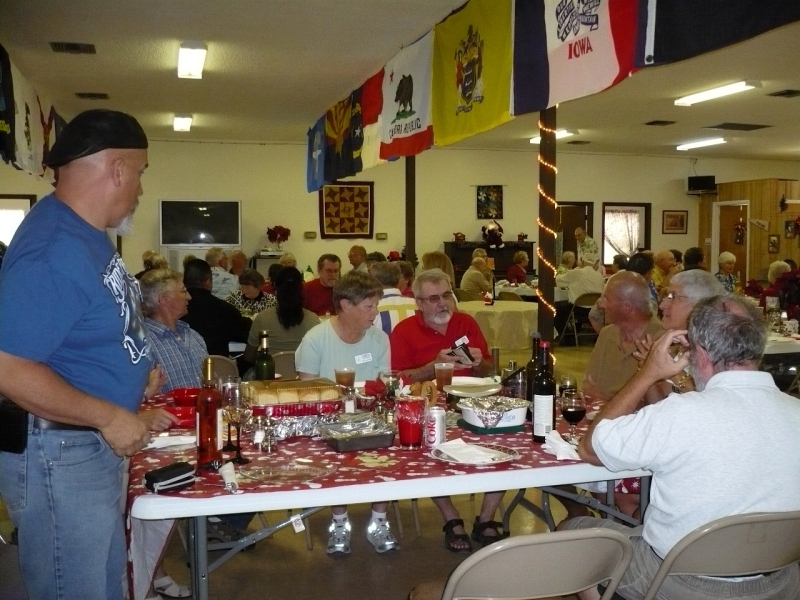 The potluck was great...about 100 or so folks attended, broken up into groupings on ten tables (based upon the original sign up sheets). We enjoyed chatting with the folks at our table and the bike folks happened to be one of them. Another couple was getting ready for a long cruise and the table hosts told a funny story about a wine tasting they were on. I only grabbed a couple of shots, we were too busy eating and socializing. 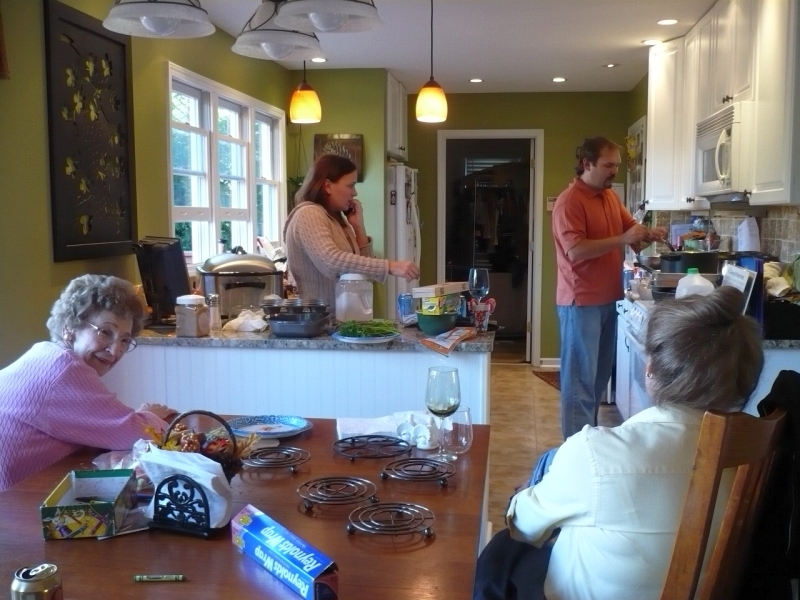 The food was great and Stu's broccoli cheese salad was a hit. 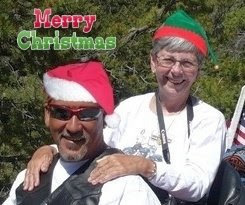 When we got back we vegged a little, did some emails/phone calls/text messages and around 4:00 headed out for a ride. It was trying to rain but we managed to get in over 1.5 hr ride staying between the drops. We found some back roads we'd never been on and rode through a good portion of the Withlacoochee National Forest, even an area of packed dirt roads with no utilities on it. Since it was dusk we half expected to have a bear or deer pop out in front of us. Good or bad, they didn't. LOL! We came back and watched a couple of movies and enjoyed the strawberry cheesecake we had bought at Denny's on Christmas eve. Yum!! All in all, a very nice Christmas...our first together. I was looking for an old blog that I had read and used the Google Reader starred items to see if I had bookmarked it that way. I never found it but thought it was interesting viewing what I had deemed important enough or interesting enough to star (meaning I would like to come back to it at some point, for some reason). Here is the list, oldest first - hope something will pique YOUR interest! Online Eyeglasses: How it works. The Elusive PD -- and How to Wrangle Yours. Point & Shoot or DSLR? Off to get my $199 progressive glasses at my local Sears...don't have to go to Mexico this year! Good through 1/3/09 at any Sears Optical. We all know we should carry one but many of us just put it off as a chore. Well, there is a site where you can create your own free Medical ID card to put in your wallet, purse, etc. It's free and easy, I've used it for over 4 years and love the simplicity. Try it...I think you'll like it! A second choice, that I've also used, it offered by State Farm. First I need to start off with a photo I took with my phone back in GA but forgot to ever post. My late husband lived in Marietta, GA for several years before we met. He always talked about "The Big Chicken". I saw it once when we lived in Atlanta. 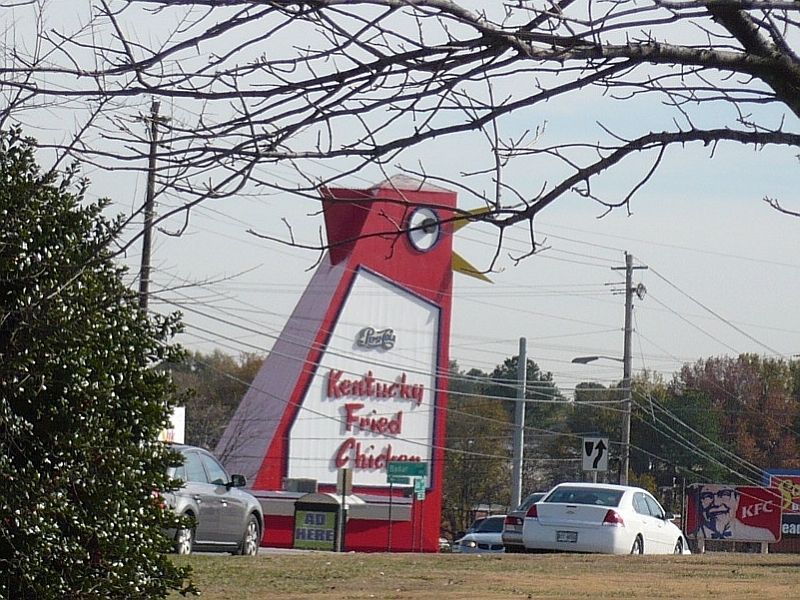 When Stu and I were getting the truck tire fixed, guess what we passed...yup, the Big Chicken. I doubly enjoyed it because it was operational....the beak opened & closed and the eyes rolled. Gave me a giggle and I had to snap a photo of it. 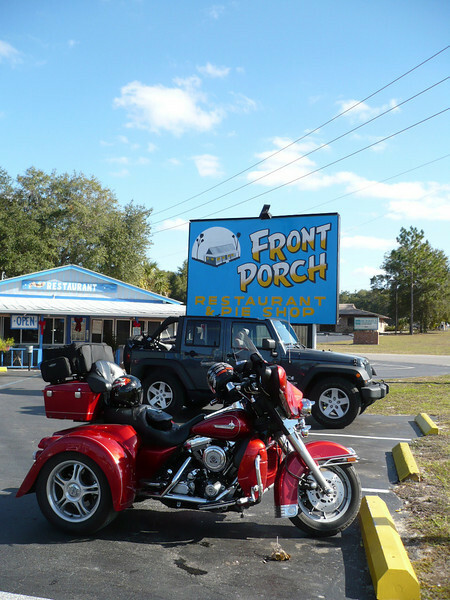 Okay, back to FL...here is a local shot I took, we didn't go inside since we were headed out on errands but I just knew I wanted the photo...LOL! 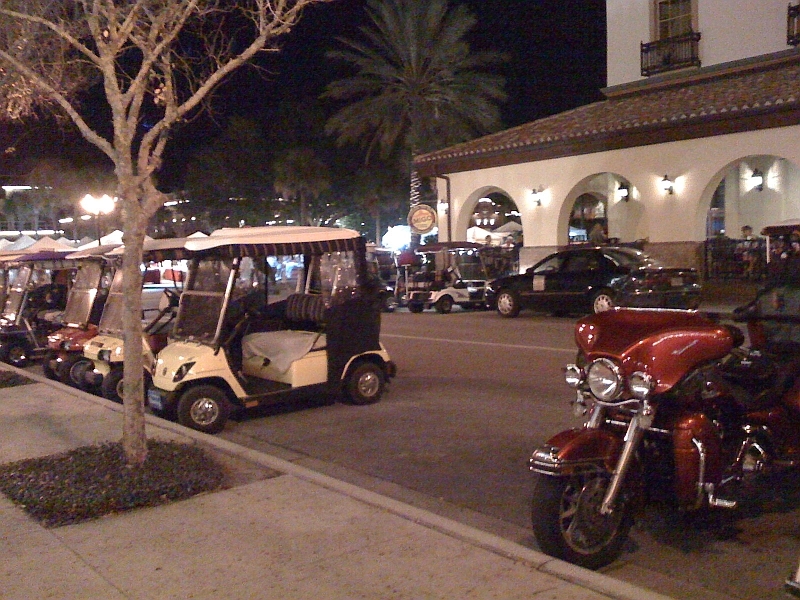 Here are a couple taken outside, looking down at the square (one of the major forms of transportation are "Golf Cars", actually tagged golf carts). Yesterday we took off on an almost 200 mile ride, intending to hit 4 Harley dealers. Three were in the greater Orlando area, one was in Sanford and the last was in Leesburg. 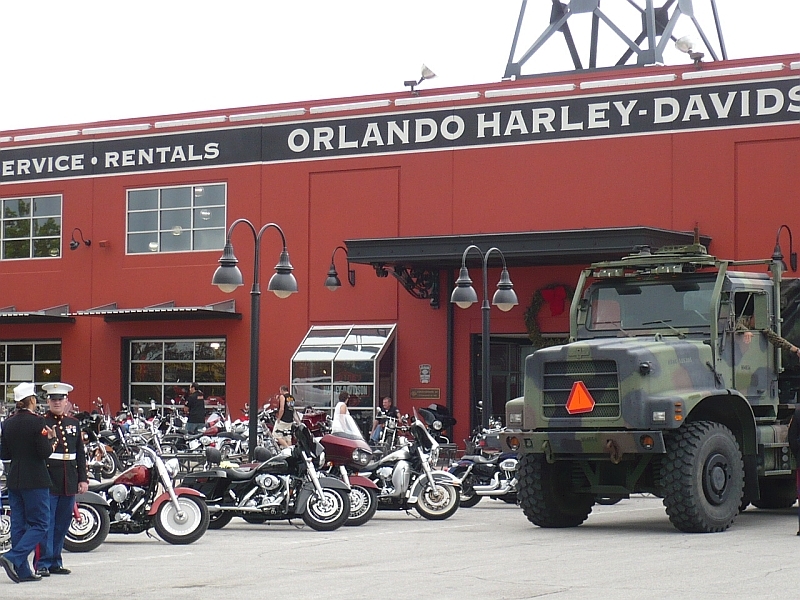 The first two Harley dealers were Orlando South and Orlando HD. Orlando South is close to the Disney area and a nice shop...larger than I thought it would be. 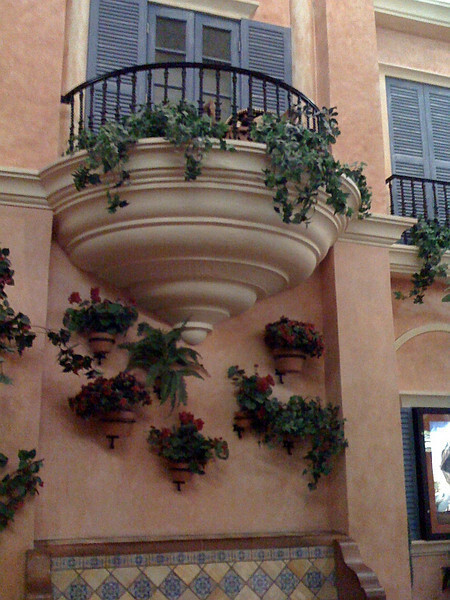 The main Orlando store is the factory store (they own the Orlando South & Orlando East shops). We ate lunch at the main store and watched as the managers presented the toys & money collected this past weekend at their Toys for Tots run. The check was for $37,000....go bikers!! From there we hit the East Orlando store (same old, same old...LOL!) 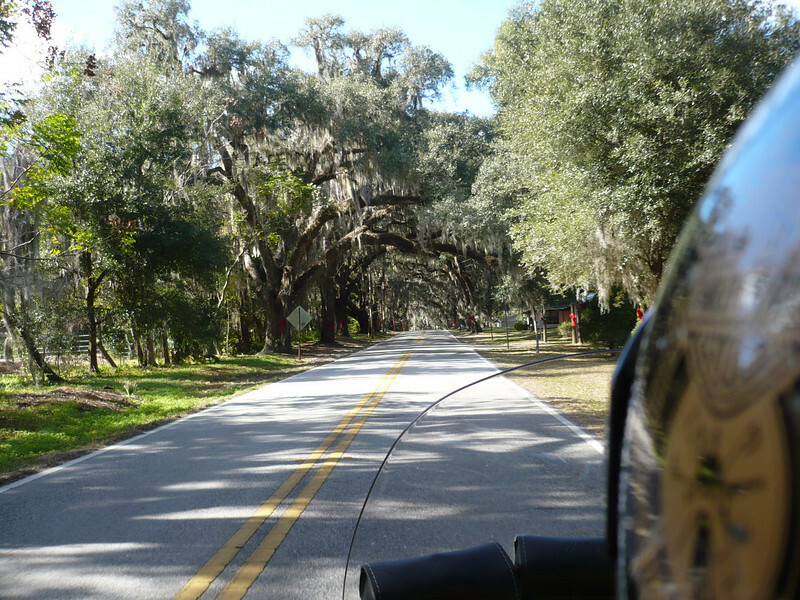 and headed northerly to the Sanford shop, Seminole Harley. There we found some great bargains...including a 70% off rack of jackets (no, I didn't get one...yes, I was tempted). Stu found a new Hawaiian style shirt as well as a clock for the "man cave"....I got them for his birthday (today - 17th). It was now almost dark and we knew the Leesburg store would be closed long before we got back so we just headed home, finding a Perkins to stop at for dinner and dessert. We got home about 9:30 last night...great day! While we are staying put, I decided to catch up on a few chores. One of them was to prepare a tool kits for the bike. Donna and I use the bike to go to some fairly remote places and the tools could prove vital. The commercially made kits are somewhat pricey so we search around for a suitable canvas tool roll. I have plenty of hand tools, so I didn't need to buy an entire kit. Donna found one on the internet. I selected the tools and started to lay it all out. Storing everything was somewhat challenging. I came up with the idea to use gray plastic conduit to store all the various sockets, torx, hex etc. Caps placed on the ends prevent loss and allow the tubes to slide in and out of the tool roll. The entire package fits easily into the trike's trunk and still leave room for beer and rain gear. 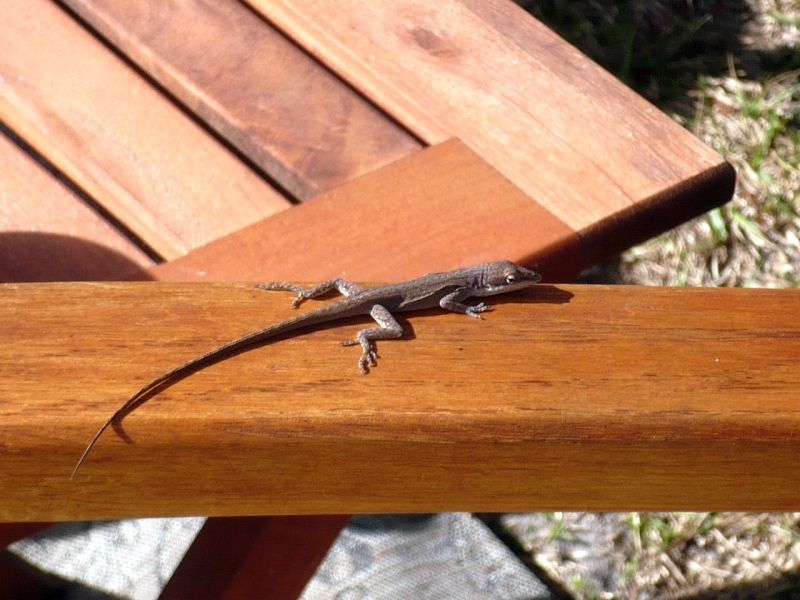 While I was in the "Man Cave" (AKA the garage) we had some visitors. A rather noisy bunch, looking for a handout. Must have heard about the bailout and they were looking for their share. I've included a couple of pictures. Keep rolling...we certainly will be! 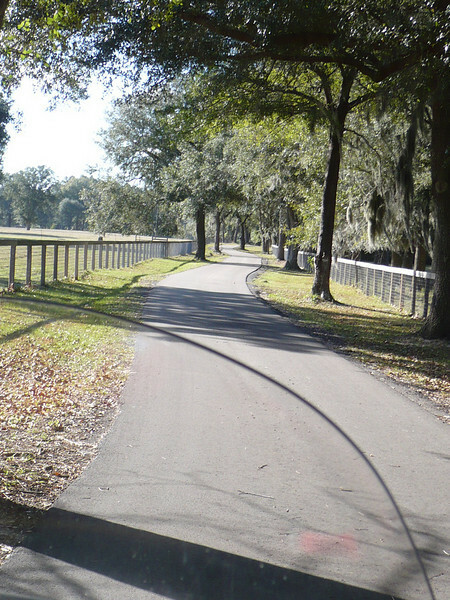 We're really enjoying out time here in Bushnell at the Sumter Oaks Escapees RV Park. Lots of little trips, just running around and enjoying the area. 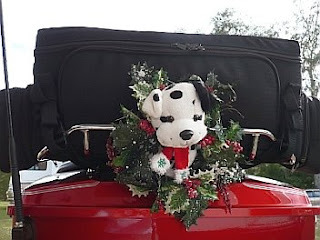 We've eaten out at local spots as well as Cracker Barrel, gone to the movies, met up with some friends here in the park, bought me a new iPhone, lost the lock/latch on the trike trunk, visited Wal-Mart, played 'Ho-Ho' (Secret Santa) here in the park, visited a trike dealer, enjoyed pie & ice cream (okay, so maybe more than once...LOL! ), and lots more. No, our service work hasn't been done...in fact it the parts haven't been ordered and we're not on the schedule yet. Long story....it's still in the works. But as life often shows us, things do happen for a reason. Turns out that Stu's mom was taken to the ER on Sunday, she's having some tests done today but due to memory loss her doctor has already determined that she should be moved into the assisted living side of her retirement center. If we had been on our way to TX as previously planned (thank goodness for plans set in JELLO), we would have been turning around and heading back. Thanksgiving over, it was time to head towards Florida for some scheduled service work. We had already made an appointment for Thursday so knew we didn't need to rush off. Good thing since it was raining on Monday morning and cold. We were on the road late, around 11:30. 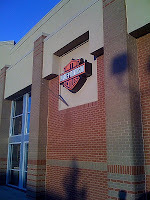 Our first stop was at the Stone Mountain Harley-Davidson. We try to stop at as many dealers as we can, Stu collects "dip dots" and puts them on the side of his tool box in the garage. We also get a second one for a friend back in Virginia. (Dip dots were originally designed to be put on the top of the dip stick and mark the oil change. Then they were changed to reflect the Harley-Davidson dealer. They quickly became inexpensive collectibles (we've paid as much as $3.00 and as little as nothing) and some folks even trade them. Stone Mountain Harley-Davidson is one of the few we have hit that do not have dip dots. So after buying a shirt for Stu (he plans to collect one from each state and is well on his way to that goal...LOL!) we continued on south. 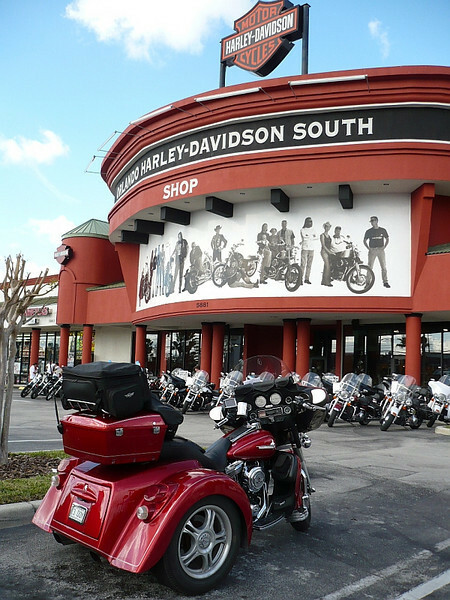 Our next stop was the Macon Harley-Davidson. 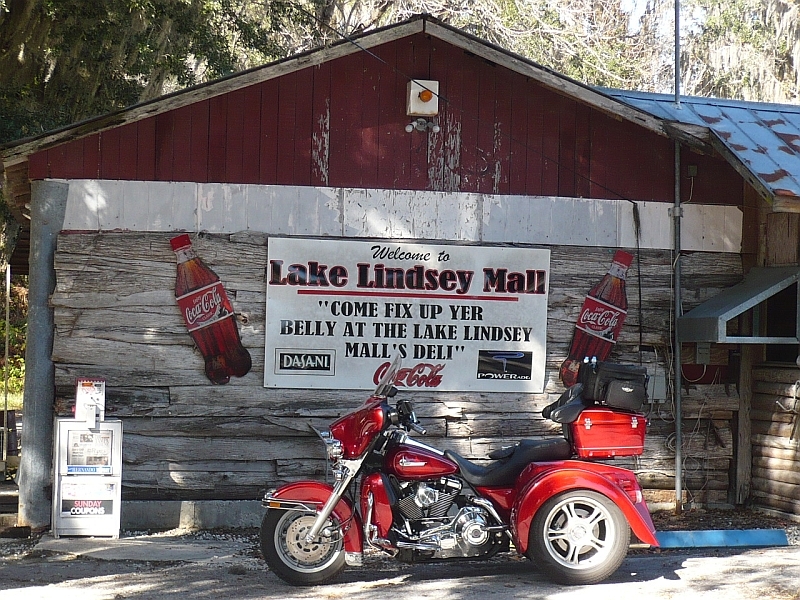 I had been there when the old store was being rebuilt as well when it was complete....it was a stop on the Pony Express Relay for Breast Cancer that I rode in 2003. We got parked and headed in the back service door. 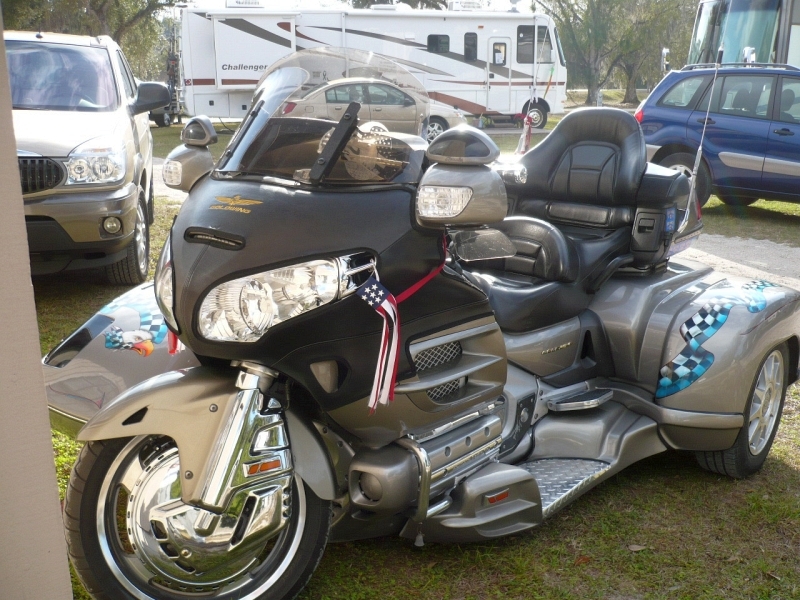 We did our usual perusing, checking out the clearance items and looking for a Tri-Glide. Bingo!! There was a red Tri-Glide on the floor. This was the second one we had run across, both in Georgia (the other was at the Cartersville Harley-Davidson store). The one in Cartersville fit me perfectly. 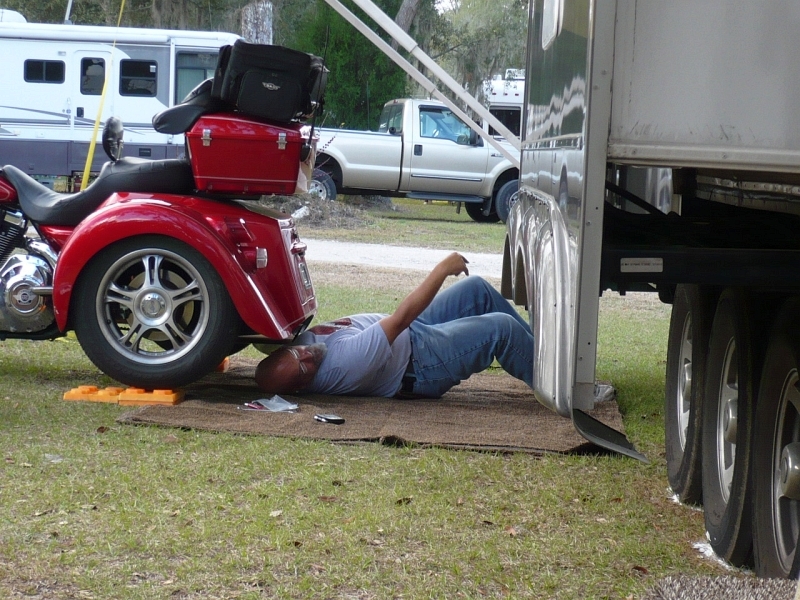 I could almost flat foot it (although that isn't a huge issue) and could easily pull in the clutch (something I can't do on our current trike, thus I can't drive it in an emergency). This one had both feet dangling in the air and the clutch was much harder...both fixable issues though. 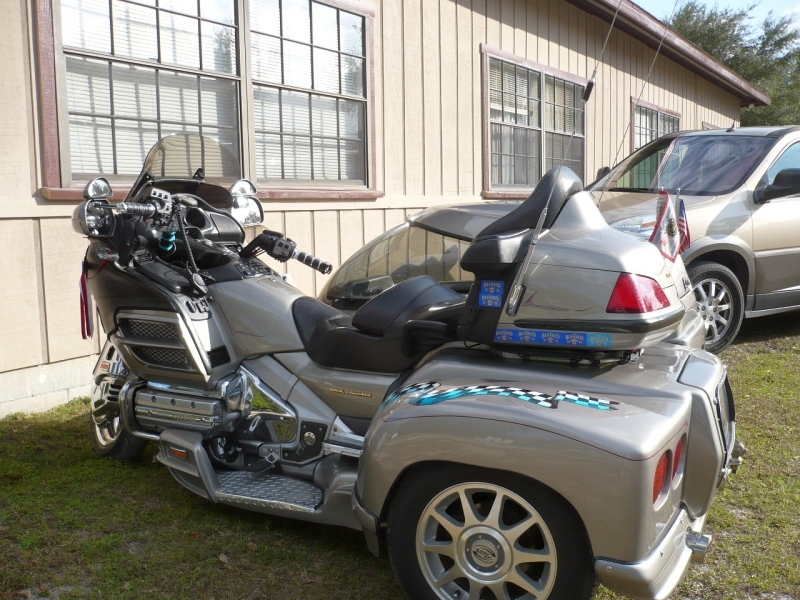 We both like the Tri-Glide and there may be one in our future...time will tell. As we meandered back towards the clothing, one of the gals stopped to point out the clearance rack to us...that was a first for me! We had already picked up a great sweatshirt for Stu - $18!! 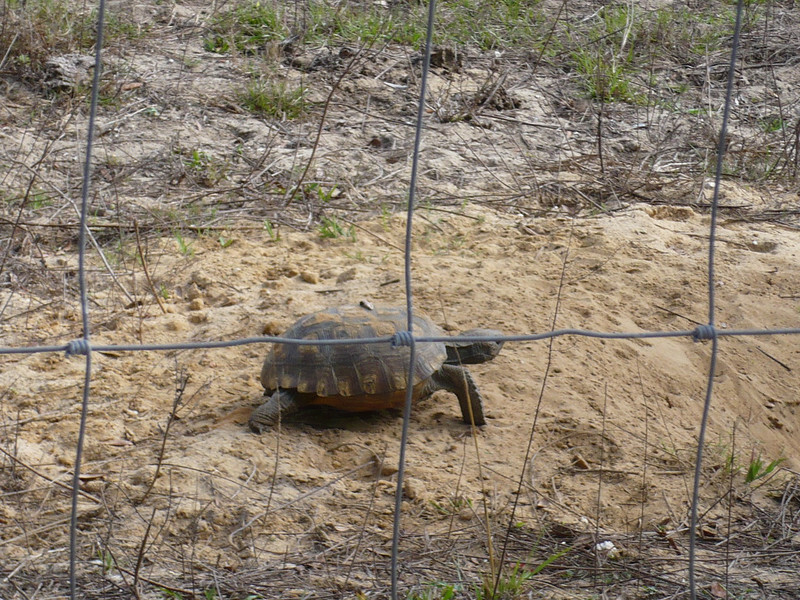 She was the gal to check us out and while standing there I noticed an unusual shirt...it had "Harleywood Tornado 5-18-08" on it. The gal explained that there had been a tornado through that took down the building next door (which had just been completed) and had planted a two by four in the side of their building. Since there was no structural damage from it, they left it in place and named it "Harleywood" - thus the shirt front. We had missed it since we came in the back. We left via the front door and snapped a few photos with the phone. 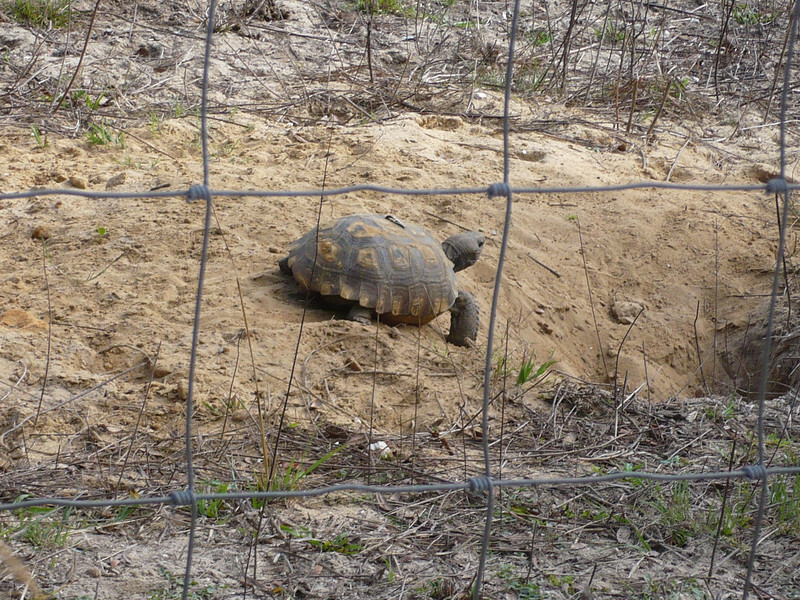 We spent the night in Unadilla, GA at the Southern Trails RV Resort (an Escapees discount park). 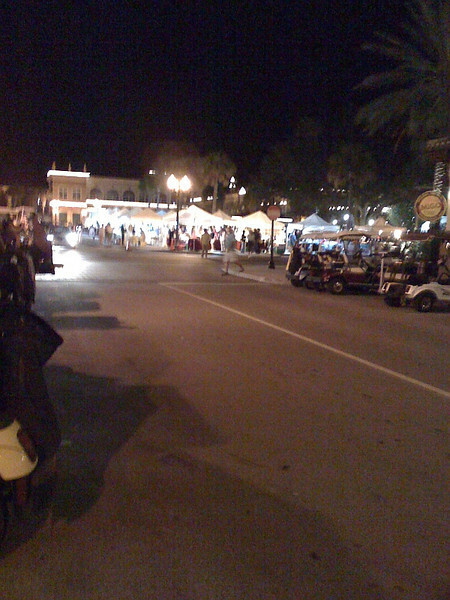 We got in just after dark but since we only cared about water/electric and the sites were very open/grassy areas, it wasn't difficult to get parked. 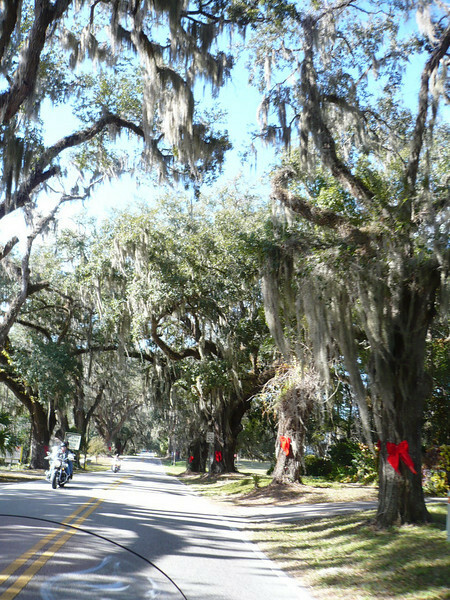 Tuesday brought a gorgeous sunny day...the high even made 56 in mid-afternoon. 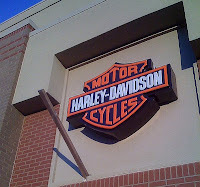 We stopped at at the Tifton Harley-Davidson and the Gainesville Harley-Davidson. Both presented interesting parking but Stu is a pro and got us in and out with a minimum of difficulty. On Sunday, while still in north Georgia, we had found diesel for $2.40/gal, needless to say we filled up. That was 10-15 cheaper than others in the area. 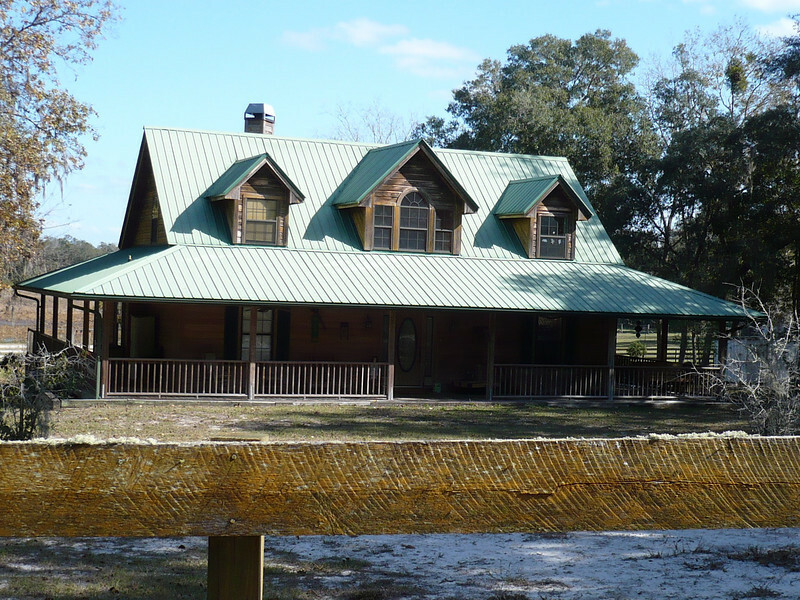 We then planned to stop at exit 2 on I-75 and top off before entering Florida where prices were 10-15 higher than Georgia. We managed to get $2.52/gal at the Flying J there as well as a great lunch. 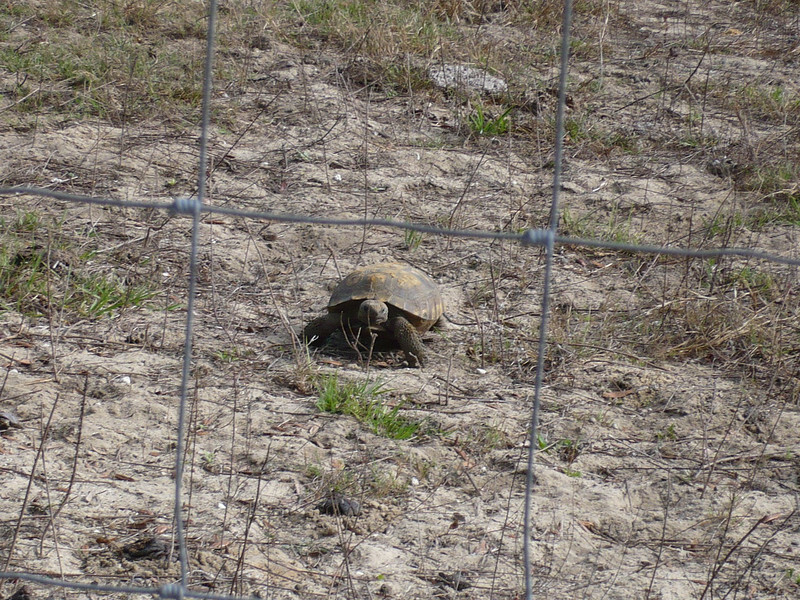 We ended up the day at the Escapees Sumter Oaks RV Park in Bushnell, FL. We don't know how long we will stay...it's looking dim for our service appointment tomorrow. As of yesterday Carefree said they had no record of our claim that was submitted the week BEFORE Thanksgiving. Grrrr.....we are still waiting to hear back. 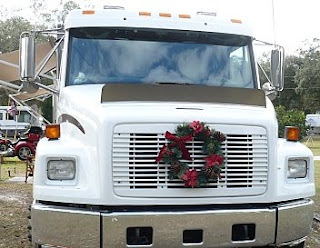 We may opt to have the parts shipped to TX and get the service work done once we arrive there. We should know more later today.. So today we plan to run errands and get in a nice bike ride. At least the weather is warming here...it was 27 at 7am but the rest of the week the lows are forecast to be in the upper 40's. Phew! By the way....if you haven't noticed, we now have a link to our calendar in the side of the blog as well as the calendar displayed at the very bottom of every blog page. We hope this will help keep family & friends informed as to our plans....but remember, our plans are pretty much always set in Jell-O. LOL! If you go to this web site, LetsSayThanks.com, you can pick out a thank you card and Xerox will print it and it will be sent to a soldier that is currently serving in Iraq . You can't pick out who gets it, but it will go to a member of the armed services. Thanksgiving has come and gone....thus we are moving on. Oops, didn't mean to make that rhyme...LOL! We are headed back to Clearwater, FL area to get some service work done on the rig. at 9 am it was 39 degrees, another reason to move further south! 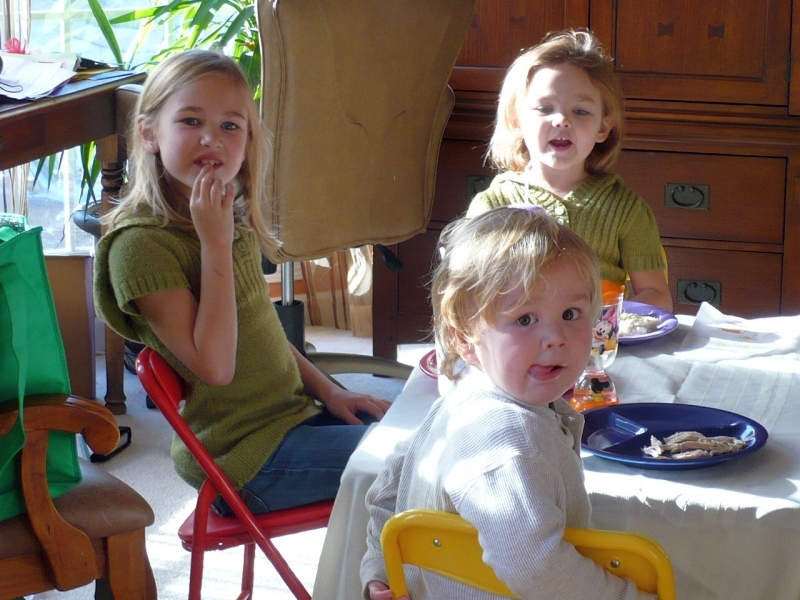 We spent Thanksgiving with my youngest daughter (Rose), her hubby (Billy) and three grandkids (ages 7, 6 and almost 3). We spent time playing Candyland, Sorry and Scattergories, watched several Christmas movies, and eating. 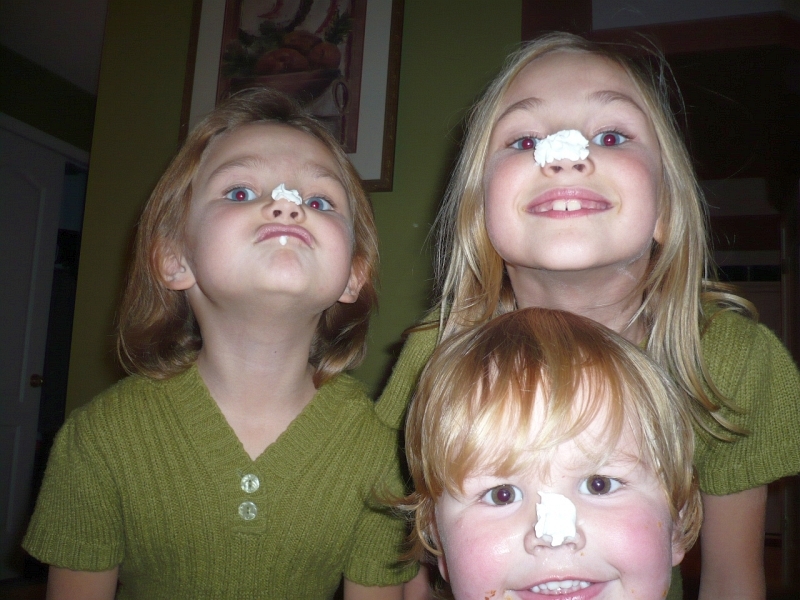 The kids had fun with whipped cream on their noses while the adults had it on their pie. Could you ask for more? We spent Thanksgiving night there so we could babysit while Rose & Billy went Black Friday shopping. The kids did sleep in later than us, then they all chose to snuggle with Stu on the loveseat (see pic - more in the album at SmugMug). Saturday night we opted to see the new movie "Four Christmases" and enjoy a dinner out. The movie was great (I never believe the critics...LOL!) and we saw previews of a couple more comedies that look good, "Mall Cop" with Kevin James and "Marley & Me" with Owen Wilson. Sunday we took everyone to brunch at Cracker Barrel (packed but still good service & food) and then they came over to see our home. Rose was ready to stay but the kids had to go...LOL! Billy was trying to figure out how he could have a getaway RV, too. Gave us a giggle. 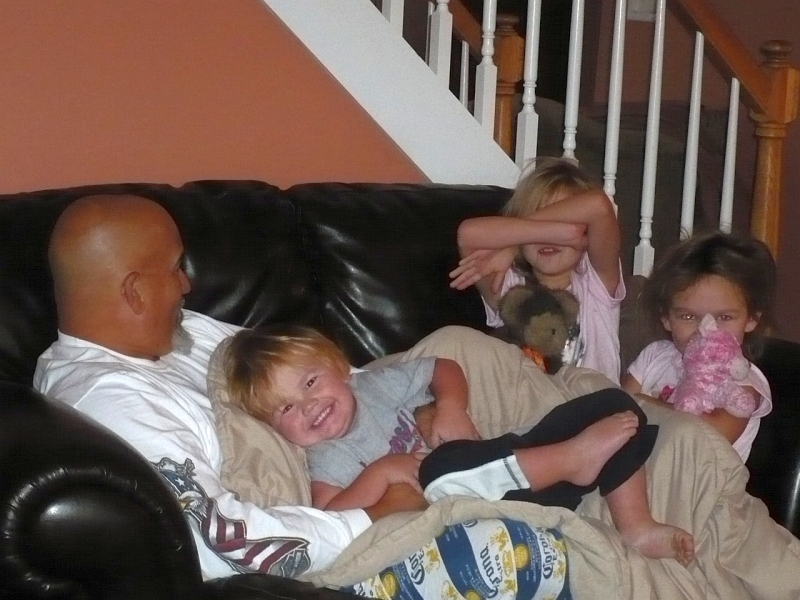 As usual the grandkids loved it....the two older ones were ready to stay. Sunday night was movie & popcorn, watching "Open Range" on DVD and just vegging out in preparation for leaving this morning. We will be on the road in the next hour or so, probably stopping in Unadilla, GA for the night.